The coast of northern Norway is much warmer than equivalent latitudes in North America and Asia, proof of the North Atlantic Drift that caries equatorial water to these northern latitudes and gives north western Europe its moderate climate. Near Hammerfest (71oN- equivalent to Baffin Island) small sandy beaches have developed in little bays on what is otherwise a high, rocky coastline. 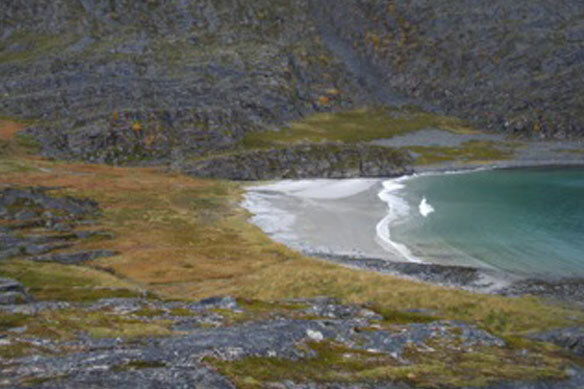 Near the fishing village of Forsol is a small beach that is only accessible by a foot track over a high rocky hill that bears very fresh scars of the last glaciation. The beach is made of fine carbonate sand derived from the skeletons of marine organisms, a type of beach that is more commonly associated with the tropics. Here, however, despite the latitude, this is the only source of sand as the resistant bedrock produces only pebbles and boulders. The small flat beach is cut by several small streams that drain the mountainous surrounding landscape. 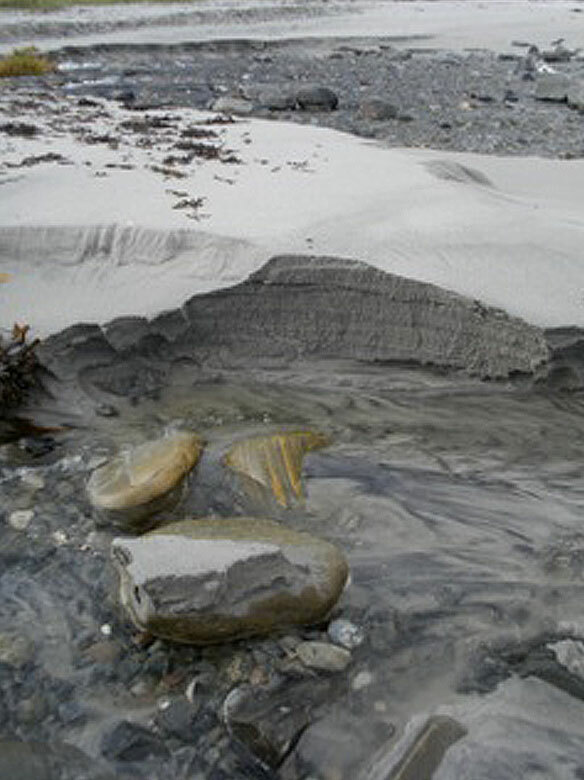 These streams create tiny channels as they run across it and reveal the sand to be just a thin veneer on the surface. 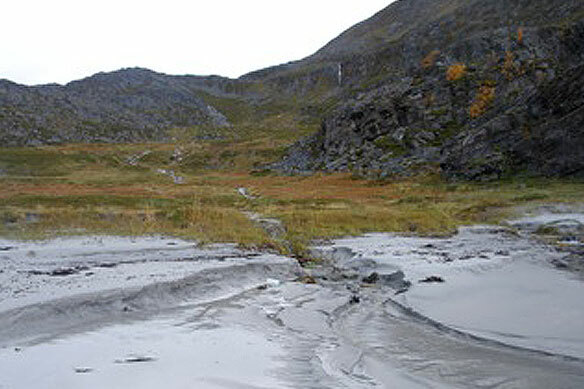 The large number of streams means that the beach hardly dries out, even at low tide. Consequently, there is only a tiny area of wind-blown sand dunes a few metres long at one end of the beach. Behind the modern beach is an area of bog peat sustained by the water flowing constantly from the steep mountainous slopes all around. 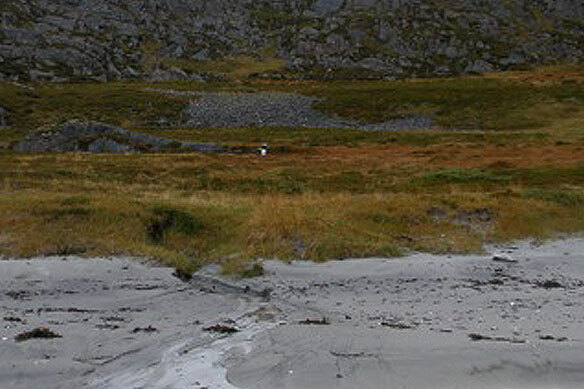 Behind the bog is a large raised beach made up of boulders, which bears testimony to the fact that the land has risen here faster than sea level for the past few thousand years at least. Despite its inaccessibility, the local authorities have provided a visitors book, complete with pen, in a specially constructed box that looks like a North American mailbox. A visitor to the area in summer will have to compete with reindeer for space as the Sami herdsmen graze their animals near the coast at this time of year. In winter they are driven inland to drier pastures. 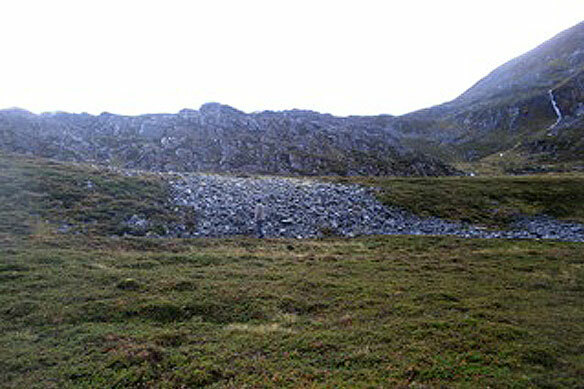 The Hammerfest area is one study site in the European “CoastAdapt” project which is working with local coastal communities to consider the options for adapting to future climate change.